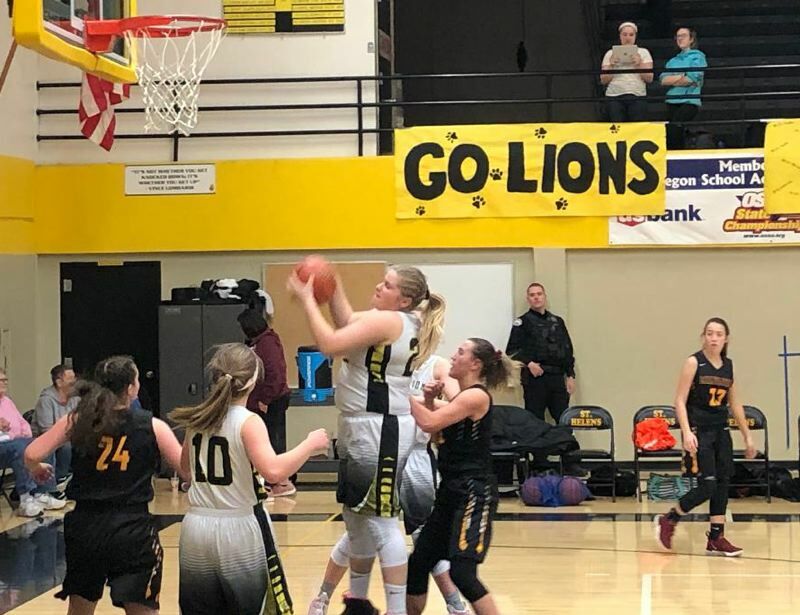 Halfway through their girls basketball league season, the St. Helens Lions are in about the best shape realistically possible. While the team wasn't happy with losing 80-36 Tuesday at home to La Salle Prep, it was only one loss — and the Lions remained third alone in the Northwest Oregon Conference, with a two-game edge on three teams tied for fourth, Putnam, Hillsboro and Milwaukie. "I told the girls after the game that I don't think we should be down, because it's a tremendous accomplishment to be 5-2 (in league)," St. Helens coach Michael Fendall said. Now the Lions will play the same seven league opponents again, switching locations. St. Helens will be on the road the next four games and six times from now through the regular-season finale Feb. 26 at La Salle Prep. The new cycle starts with a 7:15 p.m. Friday visit to Wilsonville, which is ranked No. 1 in both the Class 5A coaches poll and by the Oregon School Activities Association. "We would be ecstatic to go 5-2 again," Fendall said. "It will be challenging, because teams will be trying to get back at us and because we'll be on the road so much. "But I think we're still improving as a team." • Wilsonville (7-0 in league) and La Salle Prep (6-1) are 1-2 in the NWOC and to no surprise have proved they are 5A championship contenders. On Tuesday, the Lions were down to the Falcons only 7-1 after four minutes, but the roof caved in the rest of the first quarter. St. Helens wound up with 11 turnovers in the period and in a 22-5 hole. La Salle Prep's press was a key weapon. "They pressed us differently than others in terms of their quickness and aggression," Fendall said. "We made a lot of careless passes, especially early, and that got them easy baskets. And once you give a team like that easy baskets, they get their rhythm." St. Helens junior Maddie Holm led her team in scoring with 22 points despite a concerted defensive against her by the Falcons. "It was the first time someone face-guarded her the whole game and wasn't even looking at other things that were happening," Fendall said. "And La Salle, like Wilsonville, plays really great man defense. We don't see that a lot. Most teams we've played have been in some kind of zone, or we've been able to break their (full-court) pressure with enough effectiveness to get off a shot. "I feel like I didn't have us prepared well enough to run quality sets and get quality looks and have a counter to their defense on Maddie," Fendall said. • The Lions were happier after their Friday victory at home over Milwaukie. The Mustangs played well, led by freshman guard Cali Denson. She poured in 38 points, sinking seven 3-pointers, including several from well beyond the arc. But St. Helens' girls met the challenge with their best all-around offensive performance of the season, and the Lions won 66-54. They set a season high for points and extended their win streak to five. It rained 3's all night inside the St. Helens gym. The Lions made a season-high 10 shots from outside the 3-point line as they survived foul trouble and minor injury to Holm. "We like to run and gun and get up and down the court and shoot a lot of 3's. But I was a little surprised at how they shot," Milwaukie coach Michael White said of the Lions. "It seemed like everything they threw up went in." Holm tallied 11 points, about half her season average. She made one 3, but went to the bench for the final 4:19 of the first half after drawing her third foul. She played the first 2:19 of the third quarter, then sat down for good between head coach Michael Fendall and assistant Chris Comstock. She didn't score in the second half. "She took a knock on her leg," Fendall said. When Milwaukie made its two free throws after Holm's third foul, the Mustangs were within 26-22, and the Lions' position looked precarious. The rest of the St. Helens lineup responded big-time, however. The Lions outscored the Mustangs 8-3 to take a 34-25 lead to halftime. Holm missed two free throws to open the second half, and those were the only shots she attempted before taking a seat for the rest of the night. But by the time she exited, the Lions had a 40-30 lead, and they upped it to 57-33 by the end of the third quarter. Denson scored 10 points in the fourth as Milwaukie closed the gap, but the Mustangs never threatened to catch the Lions. Denson also had eight points in the first quarter, 12 in the second and eight in the third. For St. Helens, sophomore guard Maria Reardon buried four 3's and score 16 points, while senior post McKayla Foster came off the bench for 14 points and added eight rebounds, and senior forward Kaela Lee had 12 points. Also chipping in were sophomore forward Madison Blazek with seven points and senior guard Emelia Paullus with six. "It was great to see other players step up," Fendall said. Five Lions made at least one 3-pointer, and the team hit nearly 50 percent, going 10 of 21 from beyond the arc. "It feels good to know that we have more than one player who can score more than 10 points and that this year we're working it to other people instead of just feeding it to Maddie the whole time," said Reardon, who also had eight points against La Salle Prep. In the Milwaukie game, St. Helens fed Foster with over-the-top entry passes from the high post or wing to help her set a personal season high. "We have a lot of good coaching this year, and it's built my confidence up," Foster said. "It's helped me a lot. Basically, I was just a lot more aggressive tonight. I just had to hold my ground underneath and stay strong and go up with the ball."